Pretty cool memento of this 2018 season! I saw the Aggie T-shirt quilt someone else got. 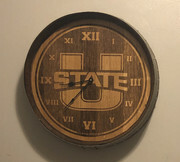 Anyone else get anything Aggie related for Christmas? Nice. Is the outside of that like a wine barrel? I got an Aggie football signed by all starters (except a few lineman) and a few backups. My sister attends USU and she got signatures after games and even DMed DJ Nelson to get a few remaining signatures! Also, she DMed Brock Miller who was able to take the basketball into the locker room and get all of the players and coaches signatures! She was also personally able to meet DJ Nelson and she told him how big of a fan me and her were and so he met up and gave her an aggie shirt, hat, and sweatbands that the team got for the bowl game to give to me! I guess perks of having a sister who attends USU....sister of the year!! Handmade by my father-in-law for my 2 year-old. He loves his new Aggie horse! Not sure where my wife ordered this from (on Black Friday, just showed up yesterday in packaging marked "Time Sensitive material"), but I think the most time sensitive square might be the "Utah State 2019 WAC Champions" one. I hope this prediction does NOT come true! The logo on the helmet is backwards, too. My sister went to Europe recently and brought me a birthday present, a signed game worn Jaycee Carroll jersey from his Spanish pro team, pretty freakin sweet!! !